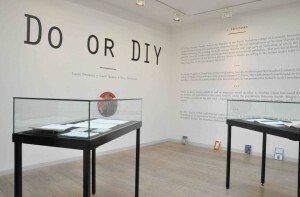 Craig Dworkin, Simon Morris and Nick Thurston, Do or DIY (York: Information As Material, 2012). 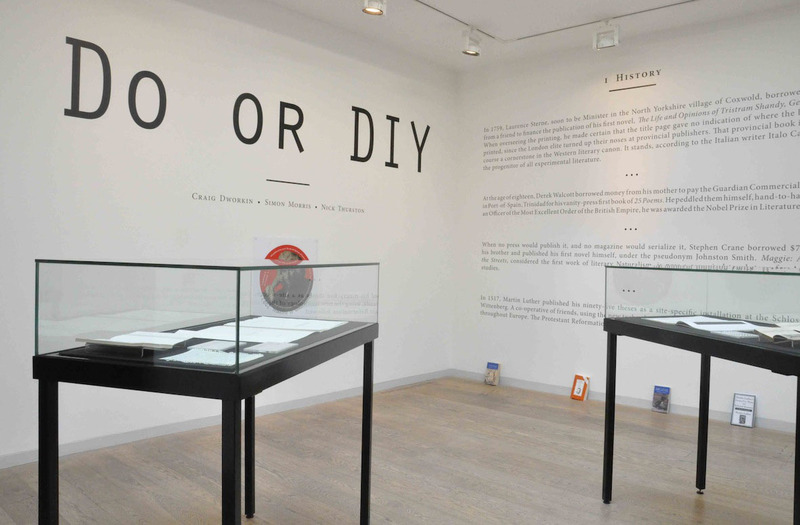 Information As Material, Do or DIY (2012), Whitechapel Gallery (London). Photo courtesy of Whitechapel Gallery. 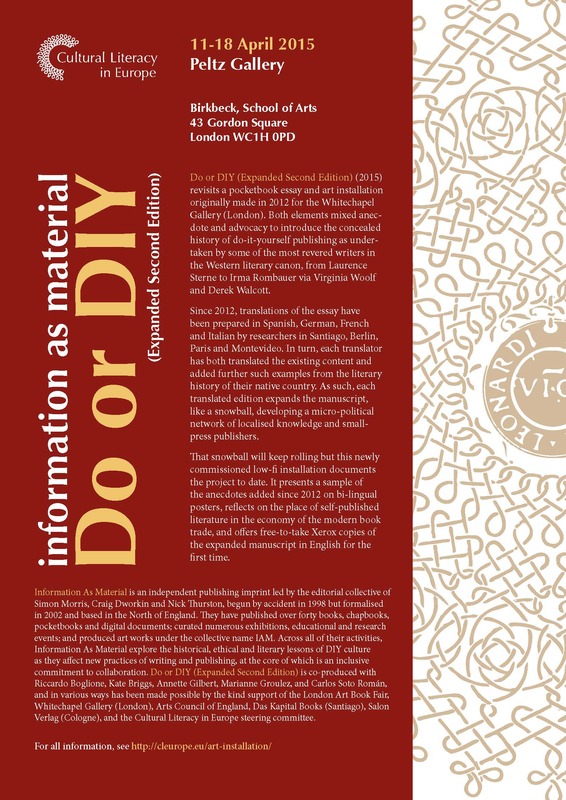 Information As Material, Do or DIY (2015) poster. Information As Material is an independent publishing imprint led by the editorial collective of Simon Morris, Craig Dworkin and Nick Thurston, begun by accident in 1998 but formalised in 2002 and based in the North of England. They have published over forty books, chapbooks, pocketbooks and digital documents; curated numerous exhibitions, educational and research events; and produced art works under the collective name IAM. 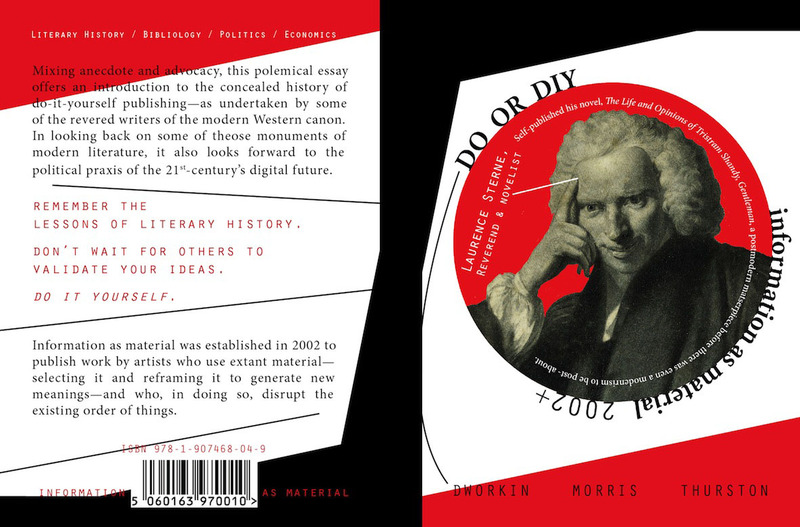 Across all of their activities, Information As Material explore the historical, ethical and literary lessons of DIY culture as they affect new practices of writing and publishing, at the core of which is an inclusive commitment to collaboration. Do or DIY (Expanded Second Edition) is co-produced with Riccardo Boglione, Kate Briggs, Annette Gilbert, Marianne Groulez, and Carlos Soto Román, and in various ways has been made possible by the kind support of the London Art Book Fair, Whitechapel Gallery (London), Arts Council of England, Das Kapital Books (Santiago), Salon Verlag (Cologne), and the Cultural Literacy in Europe steering committee.